Lincoln’s Inn Bridge is constructed in a rustic masonry style that is characteristic of ancient Lancastrian bridge building. 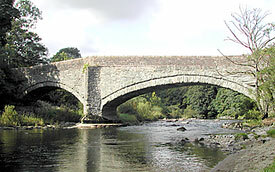 It carries the A684 road, Sedbergh to Kendal, over the River Lune. Although the date of the bridge is uncertain, we know that repairs were carried out in 1780, as noted in the "Records of the Barony of Kendale". In 1904, the upstream cut-water was rebuilt. Additional repairs were carried out in September 2007. Lincoln's Inn bridge has one main segmental span on the east side and a smaller segmental span on the west side, with pointed cutwaters upstream and downstream. The west span is partly over a dry river bed during the summertime, and takes peak winter flows. The bridge is narrow by modern standards, with a deck of some 3m width. It carries a single lane of traffic, controlled by lights, and it has no pedestrian refuges. It stands less than 3km downstream of Crook of Lune Bridge, and, probably medieval in origin, is of a similar construction.